This is a golden recipe. A heritage. A way of life. 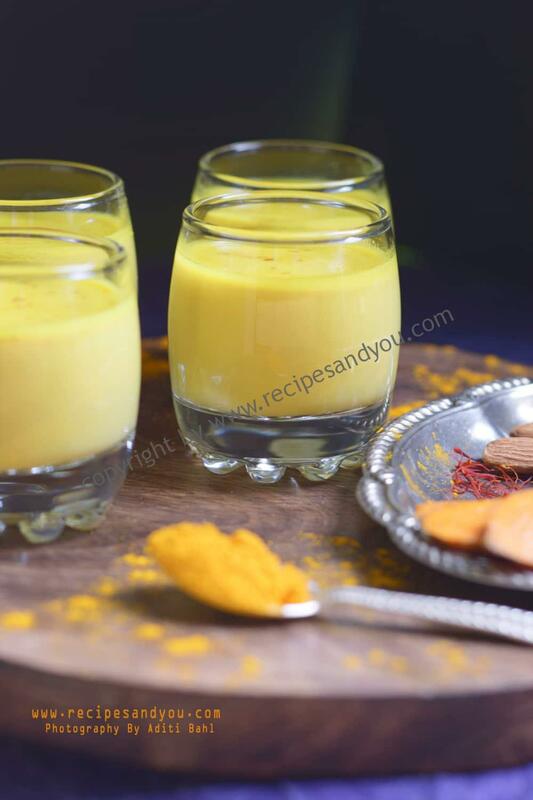 A recipe which I want to pass on to my children ,as it has been to me.This sweet warm milk, with a hint of ginger for that subdued bitty flavor, Cinnamon and green cardamom adding to the wonderful aroma and turmeric ,giving its magical medicinal properties, to make it a golden drink. As kids we weren’t fond of drinking this at all. But, now I love it. This nourishing and grounding drink is full of benefits and a treatment for many ailments. In India, there may be any house, which hasn’t brewed this milk in their kitchen. There are many recipes followed to make this traditional drink. The web is flooded with the recipe of golden Milk. How different is this recipe? Well this recipe is rich and hot, and that’s why I named it shots .As it should not be had in large amounts. It has turmeric, honey, cinnamon, saffron, raisins. All these are rich ingredients and have a warm after effect. Also, just about a 3rd of a cup will be sufficient to do the magic. The flavors are heavenly. It’s a wonderful digestive as well. So, you may prepare it as post dinner treat. The original recipe was with honey, but since its summers I do it partially with brown sugar and just add 2 tsp. honey according to the quantity prepared. In a mixer attachment, grind the almonds and the brown sugar together and keep aside. 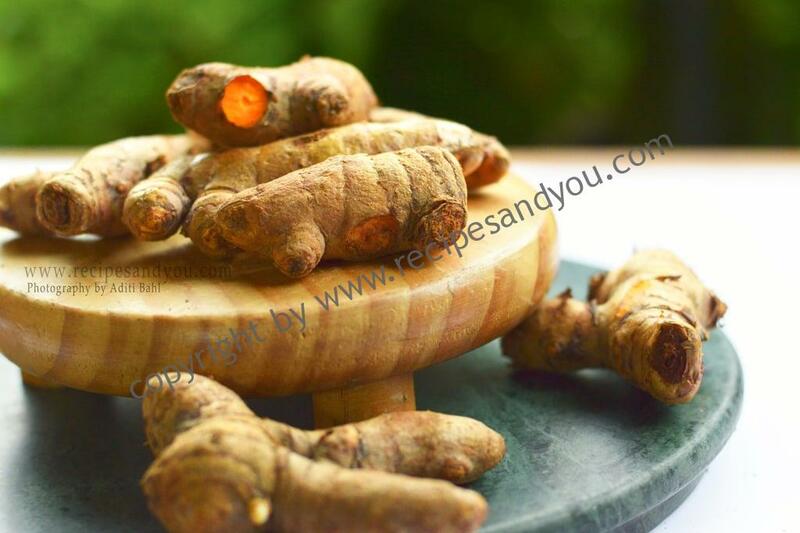 In a mortar and pestle, crush the ginger and turmeric together and keep aside. Heat the milk in a saucepan and bring to one boil. Now, simmer the milk and keep cooking for another 10 minutes. Put all the rest of the ingredients except raisins in now and let the milk be cooked on simmer. All the ingredients will leave their essence in the milk nicely. 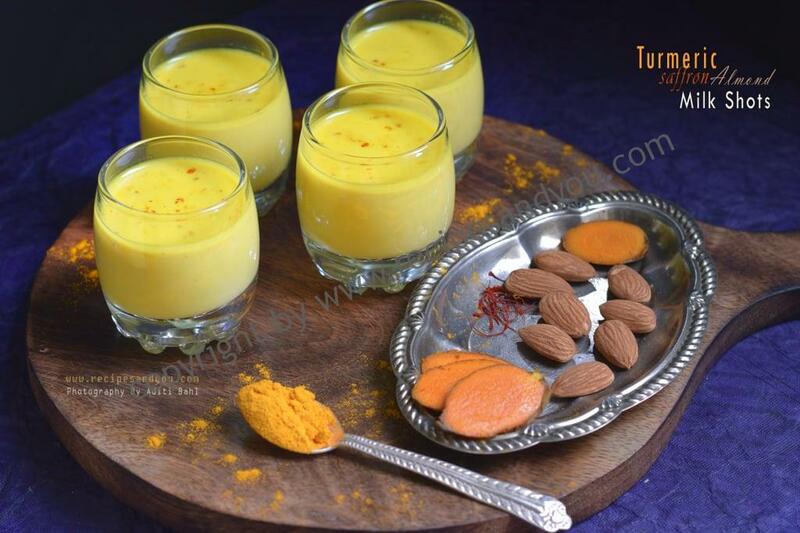 The milk will get a nice golden yellow color from the turmeric and saffron and look beautiful. After 10-15 minutes, switch off the flame and serve the milk hot.Add the raisins in each glass and serve the milk. Enjoy your healthy shot of magic just like that! Note: You may adjust the sugar amount according to your taste if you like less sweet.But because the ginger being added,this amount of sugar makes it pleasant for your palate.You may also enjoy this chilled .Just cool it down and chill in the fridge.Its tastes amazing hot or cold. 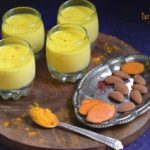 This turmeric shot recipe looks so interesting. So much so, that I want to make it this weekend. It looks creamy and delicious!! Glad you liked elaine. Thanks a lot. Thank you for sharing this important piece of your family heritage! It’s always a joy to learn about others’ food traditions. Yes kirstenits likewise. Am glad you liked.thanks. I love turmeric golden milk. I usually just do a simply concoction but your recipe looks absolutely delightful with all those flavours! Can’t wait to try it. Hi thank you ,will try this golden recipe. 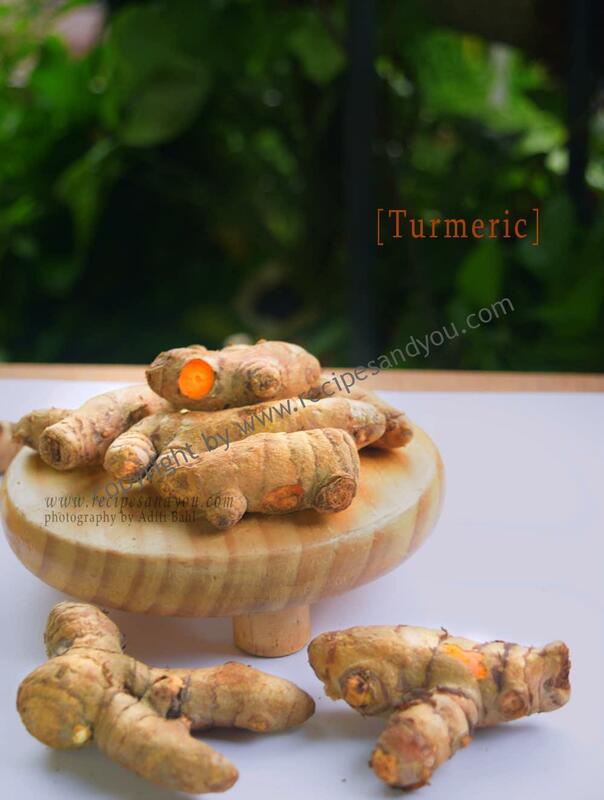 Can you please tell me how much tumeric do our cut off from the root or our much tumeric powder to i put into 1/3 cup. How much saffron threads to i use. hi Tagmieda. The recipe measurements are there, you may just take a proportionate as per your quatity.